is to efficiently and compassionately help busy people transform their spaces, allowing them to gain control, reduce stress and improve their relationship with their surroundings. Our business is built on referrals; please be assured if you send us one, we will do our very best to live up to your expectations. Tina Blazer is a Professional Organizer, a Certified Redesign and Staging Specialist, and the owner and director of Spot On Organizing in Toronto, Ontario, Canada. Book Tina Blazer to speak for your group! As you know, we as Professional Organizers get up close and personal with our clients. We help you through big life changes such as; moving, selling your home, and re-organizing your space as your life priorities shift. Our clients, in a sense, allow us to go through these changes with them. At Spot On Organizing, we don’t take that lightly. We know there is a lot of trust needed to work with people through these transitions and help them reach the other side of what is often a difficult tunnel. Building trusted relationships with clients is something we do as well as we organize. We know this because of the examples where we’ve become extensions of the family for so many clients. We’re like the car mechanic you’ve been going to for years and tell your friends about. I had the privilege of being featured in Toronto Life a few years ago. A mom (we’ll call her Sarah) approached me about helping with their kid’s rooms to get them ready for some redecorating plans. Although decorating was fairly new for Spot On at that time, this was a great way to help us expand our expertise. It was a fun project where we got to include some of our trusted associates such as Space Solutions and our favourite house painter. When we were all done, Sarah and the kids were so happy with their new rooms. Sarah had us back to organize some other rooms in the house. And clearly Spot On was a household name because it wasn’t long before Sarah’s husband, who works at a Toronto hospital, had us into his workplace to organize his office. This sparked the interest of one of his colleagues who had us do some work in his office as well. Over the next several years we helped Sarah’s family with other rooms in the home, seasonal transitions, and preparing for renovations. Then it came time for them to move. Not only did we help them with staging, de-cluttering, packing, moving, unpacking and setting up, but both Sarah’s and her husband’s parents were also moving around the same time. As if life wasn’t busy enough! But we were able to step in and help with all three moves. With all the projects over the years and connections to so many family members, we really feel like Spot On is a part of Sarah’s extended family. Our team member Laura, resident handy-girl, has been to the home often for odd jobs around the house. Now they just keep a running “Laura’s list” of the jobs for her to take care of. Sarah’s family has also referred other relatives and friends. Totalling 7 clients, with many repeats. We know this would never happen without a lot of mutual trust. We appreciate Sarah and all our clients for sharing that trust with us. We appreciate you keeping Spot On Organizing top of mind as your go-to Professional Organizer and Team Extraordinaire when it comes to helping people manage their space. Please contact us to find out about our Referral Incentive Offer on now. It’s Spring! Time to free your space and mind from the clutter that’s holding you back. Since it’s so nice outside, we thought we’d get you started with some garden organizing tips. When you’re ready to get started, please contact Spot On Organizing. If you book before May 15th, you can take advantage of our 25% sale on now. Organizing your garden tools now will make the on-going maintenance that much less of a chore. Your tools, outdoor cushions, hoses, and anything else you use in the garden will last much longer if they’re cleaned and stored properly, saving you money as well as the time it takes to go out and buy replacements. While you’re organizing your shed, you can assess the repair of your tools for summer and winter and be prepared to replace items before you need them. Hooks keep hoses from getting tangled up and damaged. Toilet paper holders are perfect for storing twine and wire. Magnetic strips can hold hand tools and keep them accessible. Large canvas totes make great storage containers for your outdoor cushions. Peg boards can be hung on the wall to hold small tools and other items. Use different colours of paint to map spaces for different categories. Wooden pallets keep potting soil and other bagged supplies off the ground, away from moisture and pets. Resin shelves are a good choice for sheds, because they won’t rust or stain like metal, and they don’t need to be painted like wood. Spot On Organizing would like to help you un-press that pause button and work with you create the functional space you want. Contact Tina to book an appointment. Offer eligible for bookings made by May 15, 2016. Does someone on your shopping list need to get organized? 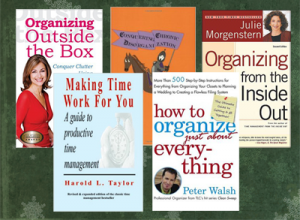 Instead of buying them yet another gadget to get lost in the clutter, I bet they’d appreciate one of these organizing books, recommended by the Toronto Chapter of Professional Organizers in Canada! In this classic, Julie Morgenstern guides the reader through a three-step process to home and office organization. Detailed instructions include suggested supplies and storage units for various activities that take place in each zone, as well as the time required for each stage of the organizing project. If your loved one has tried different methods of getting organized without success, this book by Hellen Buttigieg may be just what she needs to find a solution that works. After completing a quiz to determine whether they are a visual, kinesthetic or auditory learner, the reader is provided with tools and strategies specific to their learning style. Either of the above books would be a good choice for someone who is situationally disorganized, but for people who are chronically disorganized, conventional methods of organizing are contrary to the way their brains are wired. Those folks will benefit more from a specialized resource such as this book by Judith Kolberg. If you’re not sure, read my post Is your loved one challenged by chronic or situational disorganization? from earlier this year. While the first three books I’ve suggested provide great tips for organizing the home or workspace, Harold Taylor’s book focuses on productivity. It covers a wide range of time management topics, including delegation, making meetings more productive, perfectionism, procrastination, and more. If you think someone needs a book about organizing but you’re not sure they’ll appreciate the gesture, you can’t go wrong with this one by Peter Walsh. Organizing books can be very helpful, but some people need more than that. If your loved one has mentioned they’re ready to make some changes in their life, why not treat them to a gift certificate for professional organizing services from Spot On Organizing? Exchanging gifts with friends and family often involves a bit of stress. Will they like it? Will they use it? Will it give them more clutter to deal with? 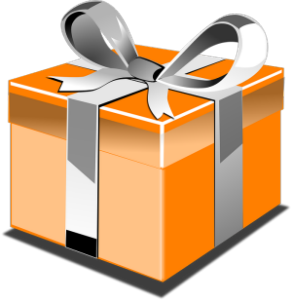 Give yourself the gift of less stress by offering a clutter-free gift. Here are a few clutter-free ideas to get your imagination moving. Explore YogaToronto to find different styles of yoga classes for everyone on your shopping list, from kids to seniors. Not sure what they’d like? Buy a Passport to Prana which allows them to attend one class at each participating studio in the city! It’s not just for beginners either – it’s a also great gift for budding teachers or committed yogis who want to check things out at various different spots. Meditation is another ancient practice that’s growing in popularity, and a mala making workshop will give your loved one an opportunity to learn about mala meditation while designing their very own mala necklace. Workshops are being held this Saturday at Kula Oakville and this Sunday at Kula Annex. Sign yourself up too, to make it a shared experience! Do you know someone who deserves to be pampered? The Evergreen Beauty & Wellness Centre in Chinatown does a fabulous foot massage for an unbelievably reasonable price. iTunes gift cards can be used for apps, books, music, TV shows and more! You can buy them in various denominations at Apple.com or pretty well any store that carries gift cards. For those on your gift list who do own a car, you can’t go wrong by giving them a CAA membership. Let me tell you what happened to me one summer. I had the car entirely packed and ready to go to the cottage. The cooler was in the car and the cat was in his carrier, safely in the back seat. The car was FILLED to the brim. We got in, ready to drive away – and the car wouldn’t start! I called CAA and they towed me, my partner, and the cat out to the cottage. We dropped the car at a nearby mechanic, had a friend pick us and all our gear up, went to the cottage, and while we lazed in the sun, my car got repaired. A CAA Plus membership is only $85 per year, and believe me, it’s worth every penny! Another thing needed by all car owners is GAS! Whether they prefer Petro Canada, Esso, Shell, Canadian Tire, Husky or Pioneer, you’ll have no trouble finding a gift card. Everyone has to eat, and who wouldn’t appreciate a box of fresh, high quality organic fruits and vegetables? Contact FoodShare to learn more about the Good Food Box program. Speaking of food, how about a cooking class for your foodie friend? Just like yoga, there are cooking classes for all skill levels and tastes, but for something new and different, check out BlogTO’s top 5 new cooking classes in Toronto. For the person on your shopping list who already has everything they need, but nowhere to put it, consider a gift certificate from Spot On Organizing. Check out our packages and pricing, then email me for additional information or to order your gift certificate. 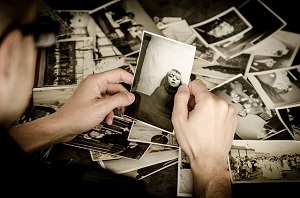 When it comes to preserving memories, there’s probably nothing more popular than photographs. Who doesn’t have boxes, drawers and albums full of photos? I read a Globe and Mail article that said we snap as many pictures every two minutes as were taken in the entire 19th century! That article was written in 2013, and with more and more people using smartphones, I’m sure the number’s even higher now. If you want your photos to have an important role in telling your family story, you have to get them out of their hiding places and organize them in a meaningful way. To help you with this process, I’ve gathered tips from a few Professional Photo Organizers. Yes, that’s a thing! The Insider’s Guide to Photo Organizing from the Association of Personal Photo Organizers outlines five steps, which I’m going to share with you today. If you read The B Spot regularly, they’ll probably sound a bit familiar, because they’re basically the same steps we follow for all of our organizing projects. Identify all the boxes, bins, drawers, and closets where your photos are stored, and collect them all in one location. Download digital photos from cameras, memory sticks and cell phones into a photo management program on your computer. Sort printed photos into shoe boxes, with a box for each decade. Next, go through each box and sort by category, e.g. Holidays, Travel/Vacations, Sporting Events, School Days, Celebrations, etc. For digital photos, create folders on your computer for vacations, holidays, birthdays, and everyday life. Label folders by year-month-occasion, so you can sort them chronologically in any software, making it easy to find specific photos. Preserve printed photos by scanning them. Save time and make your collection more interesting by scanning only the best photos of each occasion, rather than every single one. Back up any digital photos you’d be devastated to lose on an external hard drive or secure photo storage site. The internet makes it fast and easy to share photos with your friends and family. Simply upload them to Dropbox or Linea and give access to anyone you wish. To share with a broader audience, post them on Facebook or Instagram. For keepsakes and gift-giving, photo books or scrapbooks full of family photos and stories are great! If displaying treasured photos on the wall is more your style, check out my Gallery and Salon Walls Pinterest board. Develop the habit of transferring pictures from your camera to your computer on a regular basis. At the same time, erase your memory card to make room for new pictures. Photo Organizers recommend creating two backups of your digital photo: one in the cloud, and one on an external hard drive. If you don’t like the cloud, store them on external hard drives from two different manufacturers to minimize the chance of them both failing at the same time. Thank you to Caren Osborne, Natalie Gallagher, Jenny Herrero, Amy Rehkemper, Cathi Nelson, Rachel Jenkins, Philip Griffith, Lisa Tonjes Moritz, and Regina Sanchez for the above photo organizing tips! Wow! Who knew there were so many things to think about? But wouldn’t a photo organizing project be a great way to pass away the cold winter months? How many different places are your photos right now? I guess it’s no secret that I have a sentimental streak. I’ve already blogged about some of my treasured keepsakes. I’ve also shared some ideas to help you organize your memorabilia and preserve your family memories. But don’t get me wrong. It’s just not practical to keep mementos of everything. For one thing, finding homes for it all would be a logistical nightmare! Just as importantly, it doesn’t give proper honour to those items that are truly special. This where it gets hard. When you’ve lost someone special, or as your babies grow up, it’s tempting to hold onto things that keep your memories alive. Sometimes you’re compelled to keep a loved one’s belongings even if you don’t know the story behind them. 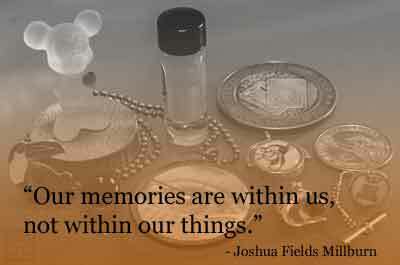 We tie our happiness or sadness to these items and store them away. Often we rarely look at them; we simply WANT to keep them for the emotions they evoke. Through helping clients deal with such items and my own experience, I’ve come up with a few ways to help you get through the process of letting go. Instead of just saying, “I need to get rid of this stuff,” set a measurable goal, such as whittling down from seven boxes to three. Have a plan in mind as to what you’ll do with the items you decide to keep. Recognize that going through your keepsakes, or those of your loved one, is going to evoke strong emotions, both bad and good. Just go with the flow. Your goal at this point is to process your emotions and get to a place where you can let go of the actual objects – or at least some of them. It’s totally okay if you’re not ready to get rid of everything, and there will likely be treasures that you’ll want to keep indefinitely. In most cases, the value isn’t in the objects themselves, but in the stories behind them. So find someone to sit with you as you sort through your keepsakes – perhaps a younger family member – and tell them the stories. If they record a video of you holding the items as you talk about the memories associated with them, it will be even more special. When it comes down to it, you don’t need to clutter up your space with physical objects to preserve your important family memories. Is there something you’ve had a hard time letting go of? How did you finally do it… or did you? Photo courtesy of Sean Kirkpatrick, used under a Creative Commons license. 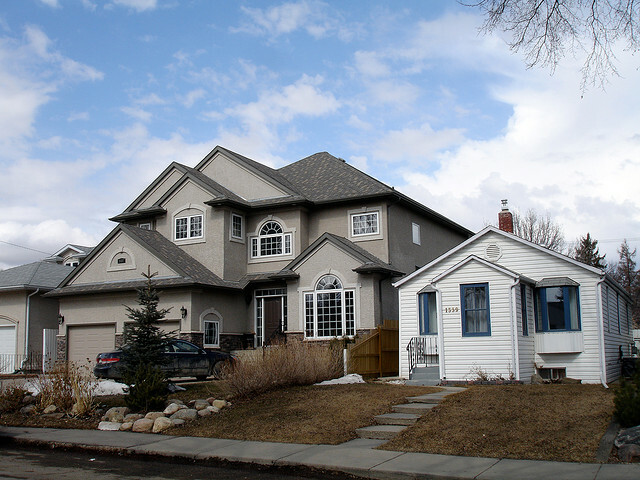 You probably don’t have one of the largest houses in Toronto, but I’m going to tell you about a secret weapon that will increase your storage space even if you live in Toronto’s smallest house! Unless you have no doors whatsoever, you have at least five feet of storage space in just about every room of your house! You can access this hidden storage space simply by hanging shoe organizers on the back of the door. That’s more than a few, isn’t it? I guess you can tell why shoe organizers are one of my absolute favourite tools for creating space around the home. To see some of these ideas in action and for more inspiration, please check out my Pinterest Board Things to Do With Shoe Organizers. Follow Tina Blazer’s board Things to do with shoe organizers on Pinterest. Are you also a fan of shoe organizers? How do you like to use them? Photo courtesy of Daryl Mitchell, used under a Creative Commons license. Are you getting ready to feather your nest for this coming winter? 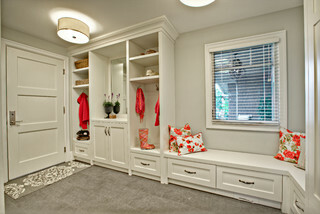 The mudroom is not only the first stop to your home but it also gets much busier and fuller as the temperature drops! Why not start your nesting here so you’ve got a spot for everything that goes in and out of your house on a daily basis? Shoe racks or shelves encourage family members to remove footwear as soon as they come in, so you don’t end up with wet and dirty footprints tracked throughout your home. Maximize your footwear space by using floating or mounted shoe storage so you can put a boot tray underneath. Everyone is more likely to hang up their coats, keeping them off the furniture and the floor, when you provide handy hooks. Mounting lower ones for kids and higher ones for adults saves space while making your system more user-friendly. The same hooks can be used to keep all kinds of things off the ground: backpacks, umbrellas, dog leashes, scarves, mittens and so on, but in some cases, baskets on shelves might be more practical. You can decide whether it makes more sense to have one basket for each type of item or one for each family member. Just make sure you designate what is to go in each basket, and label them accordingly. Placing keys in a basket or bowl or hanging them on a key rack means you’ll always be able to find them, eliminating unnecessary delays when you head out the door. Designating a basket or shelf for incoming mail reduces the risk that bills will get misplaced, leading to costly late fees. Do you like to stand up while you’re putting on your shoes or boots? Neither do I. A comfy bench makes it so much easier, and can be a handy place to set down your bag while you’re helping younger kids to put on or take off their outdoor gear – much better than the floor! You might even find one that has storage inside for toys, or out of season outerwear! For an even tidier mud room, try TRONES storage cabinets from IKEA. Designed to hold six pairs of shoes, these wall-mounted units are great for hats, gloves, scarves, and other small items too. There’s even a recessed area on top that’s a great spot for your keys, pocket change and cell phone. I love finding lots of ways to use great tools. How To Use IKEA Trones Storage Boxes in Every Room of the House shares lots of creative inspiration for how to use this great cabinet . Even if there’s no mud room in your home, you can apply these same ideas to your own entryway. For more on this subject, read my earlier posts Five Ways to Stop Clothing Clutter At The Door and Three Ways to Stop Paper Clutter At The Door, and check out my Pinterest board, Come On In. Going away to college or university is often seen as a rite of passage, the first time living away from home for many young people. If you’re not prepared, it can come as a bit of shock to arrive on campus with your personal belongings, only to discover that there just isn’t enough space for everything. A little advance planning can go a long way, so I’ve created this five-step guide to help you through this exciting moment in your life. Step 1: Obtain as much information as possible from your school’s Housing Department. Are furniture and bed linens provided, or do you need to bring your own? Are there any restrictions on what you’re allowed to bring? What is the size and shape of your room? What amenities are available in common areas? You can probably find most of these details on the school website, but don’t be afraid to pick up the phone and call if you can’t find the answers you need. Step 2: Get in touch with your roommate (if applicable). With limited space, it probably doesn’t make sense for both of you to bring large items such as TVs and printers. See what arrangements you can make. Perhaps you can share the costs of renting a mini-fridge. Step 3: Draft a floor plan. As you might have done with your bedroom at home, map out your space, planning zones around your habits and preferences. Since you’ll be spending many hours studying and working on your computer, pay particular attention to lighting, both natural and artificial. 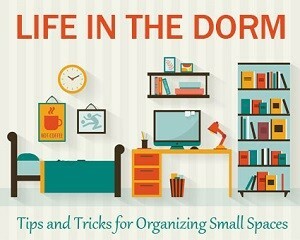 Step 4: Create a master list of everything you’ll need in your dorm room. Storage hooks to hold book bags, purses, jackets, towels, etc. Storage caddies for school supplies, makeup, etc. You probably won’t need or have space for everything they suggest, so be realistic! What will you do while you’re away at school? There’s not much point in bringing hobby supplies if your time will be filled with part-time work, academic and social activities. How often will you be returning home? It may be more practical to bring only what you need in between trips, and to swap seasonal clothing as needed. Step 5: Review your master list and create a separate list for items you need to purchase. You might be better off shopping for some things locally after you’ve arrived on campus. This will give you a chance to make sure you really need and have the space for them, and eliminates transporting large items. Remember that no matter how much you plan, you may run into changes that are beyond your control. Perhaps you were expecting a room on your own, and you end up sharing with someone else. Or the room isn’t quite the size you were told. Just roll with the punches, and don’t let it spoil this exciting time in your life. Please ‘like’ our Facebook page for more organizing ideas! 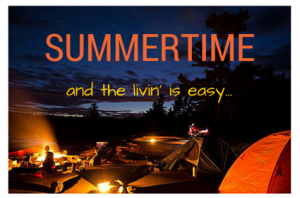 Now that summer’s here, you may be thinking about going camping. There’s nothing like some well-deserved R&R! But before you throw everything in your car and drive away, remember that camping is just like any other aspect of your life – a little planning and organization will go a long way. I went camping last summer for the first time since I was a kid, and discovered a few tricks that made for a much more enjoyable experience. In addition to basics such as rope, tarps, water, and playing cards, we found that folding buckets, water jugs, and small tables – pretty well anything that folds so it doesn’t take up a lot of space in your car – are great. A large plastic sheet to place on the ground when you are emptying the car allows you to lay everything out while you’re setting things up without putting it on the dirty ground. A Frisbee can be used as a fire-fan as well as a fun pastime! A large umbrella can be used to keep away rain, catch water, block the sun, or as a prop for kids’ games. One of the best parts of a vacation is eating different food than you eat at home. Smores are a traditional camping favourite, but you may want to also bring along some special drinks and appetizers, just in case the cooking dinner over the fire takes longer than expected. When you set up camp, you’re building your temporary home, so you need to utilize the space you have available as efficiently as possible. Why not create an ambiance and purpose for each area you set out for yourself? There are many ways you can accomplish this. Lighting is a fun and easy way to use to create space and purpose, whether you use solar lighting for patio lanterns, ground illumination to create pathways, reflectors, candles, or a combination of these. Flooring such as patio rugs or rice mats outside the entrance will help keep the dirt out of your tent or RV. Positioning: Create a triangle with your tent, car, and picnic table to define your space. The Smart Dryer provides 30 feet of drying space in a small area. The Stove Topper acts as a cutting board or extra counter space when you need it. The Extend-A-Shower rod gives you more room to shower and can also be used to drip dry bathing suits, towels, or laundry. Are you thinking of staying home this summer because you can’t stand the thought of coming back to the clutter? Contact me to find out how Spot On Organizing can help you. 416-997-0730 . tina@spotonorganizing.com . Serving Toronto and surrounding areas.